A Verb for Keeping Warm: What the Hell? My goodness! It's been forever. I miss you! You know when time has gone by, and you don't know where to begin...but we're good friends, so I'm sure we'll be caught up in no time. 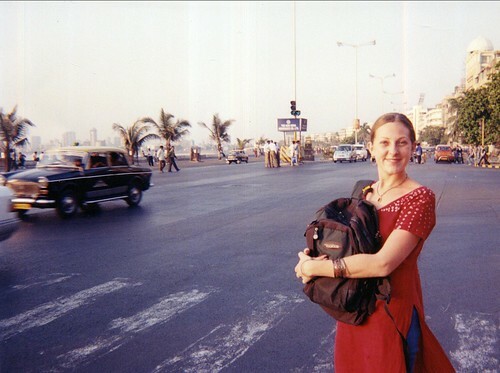 When I lived in India, digital cameras were just beginning to fall into the hands of amateurs. I played it safe and stuck with my 1976 Nikon 35mm. Because my memories or more or less stuck in 35mm, I had shared relatively few images with the public. Which really is a shame, firstly, it being so pictorial, secondly, being that my time there has shaped my life to a very great extent. Today, that changes. I found some photos of me in Indian that are actually in a computer, meaning that I can upload them. We actually hooked up the scanner as well - which means that hopefully I can post more photos of India and blog a bit about my research there. 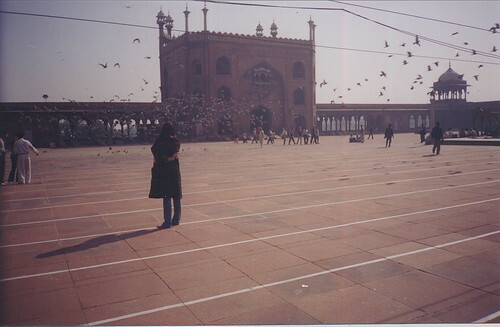 Here I am at the Jama Masjid in Delhi. This place is absolutely magical. And, it is huge. This shot captures only a quarter of the courtyard. This is Marine Drive in Bombay aka Mumbai. Right there, across the street is the Arabian Sea. The kurta I am wearing is my 1st attempt at dyeing and bandhani (the Indian form of Shibori). I took a piece of undyed fabric, and wrapped the sections which are white with cotton thread. Then, my friends dyed the fabric red. I untied the threaded sections - which resulted in the polka dot pattern you see in the above photo. Then, I took the fabric to the tailor and had it sewn into the kurta. The back of the kurta also has resist tied patterns. Today's post, I am going to leave short and sweet. There's been a lot on my mind over the past few months and I can't wait to share. Let's just say, there has been death, there has been life, and then there is local manufacturing.